Declines in populationIn 1800, hen harriers were common and widespread across the UK, but by 1850, when driven grouse shooting became popular, records show hen harriers were routinely shot, and by 1900 they were persecuted practically to extinction as a breeding bird on mainland Britain. From the time of the First World War onwards, the population started to recover naturally, however regular surveys show that since the turn of the millennium, numbers are declining again and ongoing illegal killing and disturbance threatens to drive the birds to the brink of extinction once more. 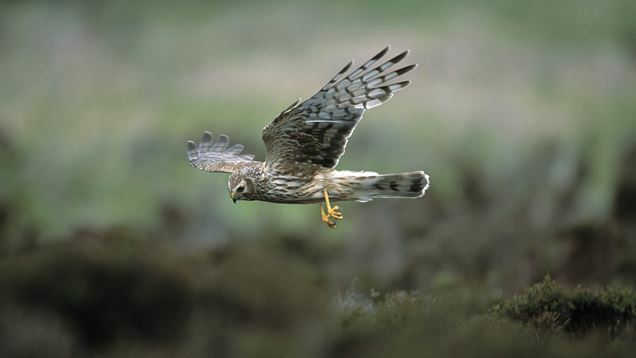 Tackling hen harrier persecution The RSPB is committed to protecting our UK hen harrier population and works alongside landowners, raptor workers, conservation organisations and protected landscapes to provide the conditions for the population to recover. This blog has been running since March 2010. We created it for one simple reason: to highlight the relentless and illegal killing of birds of prey in the UK, particularly focusing on the close association of raptor persecution with game-shooting interests, especially grouse and pheasant shooting. Evidence is clear that gamekeepers are responsible for more illegal raptor killings than any other group in society. We have a particular interest in raptor persecution in Scotland, but we also document incidents that take place in other parts of the UK and in the Irish Republic. So far the blog has received over 4 million views. Birds of prey have been systematically persecuted here for over two hundred years. And even though it has been illegal to kill a raptor for over sixty years, since the passing of the Protection of Birds Act in 1954, the persecution continues to this day. It’s been happening quietly and insidiously, behind the scenes, for decades. There has been very little publicity, even on the rare occasions when someone is successfully prosecuted, and very little information has been available. We wanted to change that. Our aim is to expose what’s been going on, and where it’s been going on, and where it still goes on. Our hope is that, as more people become aware of the problem, more people will take notice, spread the word, stand up and say enough is enough. Thanks for visiting our blog. Please read it, be outraged, and do something about it. Tell your friends, colleagues, family, neighbours about the ongoing illegal persecution of these birds. Lobby your MSP/MP. Get active on social media. Just do something. Thor is no more: First hatched hen harrier in Bowland for three years disappears in suspicious circumstances. Young hen harriers were fitted with tags as part of the RSPB’s EU-funded Hen Harrier LIFE project and we watched with anticipation as the chicks grew and started to fly away from their nests and make their way into the world. Unfortunately, it was unlucky 13 for one of our brood. Young male hen harrier Thor fledged from a nest of four chicks in the Forest of Bowland and his satellite tag was fitted in mid-June. After leaving the nest he remained in the vicinity for several months. His tag was transmitting regularly when it suddenly and inexplicably stopped. 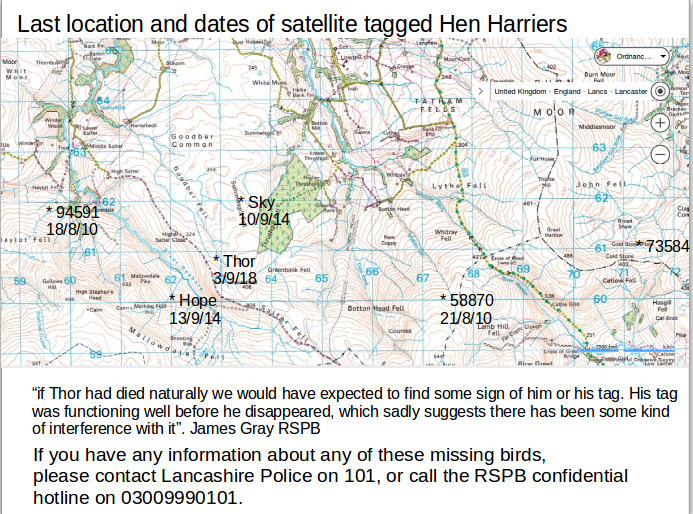 His last known fix on 3 October 2018 showed he was over Goodber Common near Salter in Roeburndale , Lancashire, adjacent to a managed driven grouse moor. This disappearance was reported to the police, and a search revealed no sign of the bird or his tag. Thor is the fourth bird to disappear in the past two months, following the disappearances of Hilma, Octavia and Heulwen in August this year. 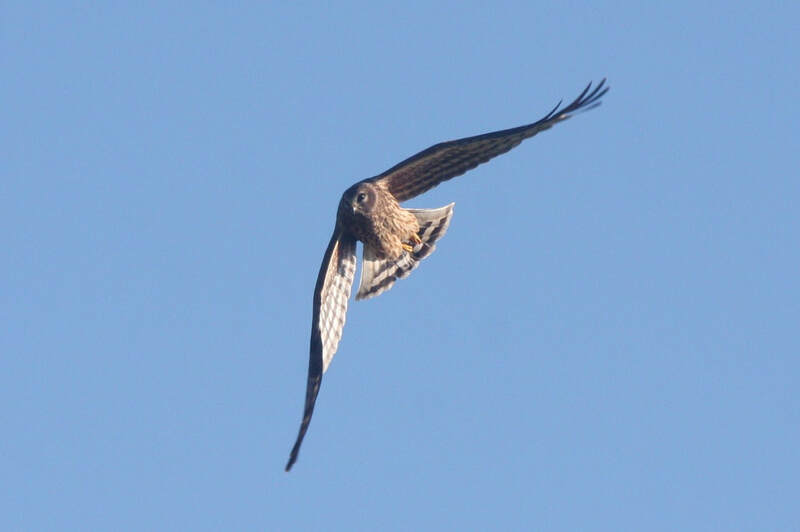 Alarmingly, the last known fix for Thor is directly between the sites where tagged hen harriers Hope and Sky were last heard from before they disappeared back in 2014. If anyone has any information as to what may have become of Thor, you can contact Lancashire Police on 101. According to Guy Shrubsole’s excellent Who Owns England website, the grouse moors to the south of Goodber Common, shown in our map above, belong to the Duke of Westminster’s Abbeystead Estate. Nobody will be the least bit surprised that yet another young hen harrier has vanished close to a grouse moor in northern England, and especially in the Forest of Bowland AONB. We know from Natural England’s HH sat tag data (2007-2017) that Bowland is one of several areas (along with the Yorkshire Dales National Park and the Nidderdale AONB) where the land is dominated by driven grouse moors and where young hen harriers tend to disappear. We prepared a map of those areas in August 2018 after Natural England had finally released the HH sat tag data (which didn’t include details of any missing RSPB-tagged birds). So what happens now? Absolutely nothing of any significance. The grouse-shooting industry will either stay mute and hope the news blows over quickly, or we’ll hear from Andrew Gilruth of the GWCT telling us how well the Government’s Hen Harrier (In)Action Plan is working (it isn’t, it’s a sham), or we’ll heard from Amanda Anderson of the Moorland Association that there’s no need for concern as she saw Thor flying past her kitchen window just yesterday. DEFRA Minister Dr Therese Coffey will be too busy shuffling around in her handbag to even notice her Government’s complete and utter failure to protect this species.